A rare blue diamond that has spent the past 300 years in Europe's royal houses has been sold at auction in Geneva for $6.7m (£5m). It sold after just four minutes of bidding at Sotheby's, easily passing the auction house's estimate of $3.5m-$5m. 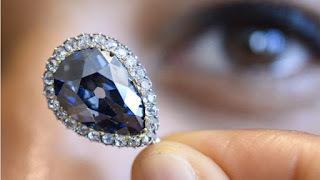 "We were expecting a good result but we started from $3.5m and we ended up with $6.7m, so we exceeded our expectation," said Sotheby's jewellery specialist, Daniela Mascetti.